Creating a summer centerpiece isn’t hard. Let me show you how to use items you already have to put one together in 5 minutes! Hint: think outside of the box. …into this in just a few short minutes! Scroll down for the step-by-step photo guide. 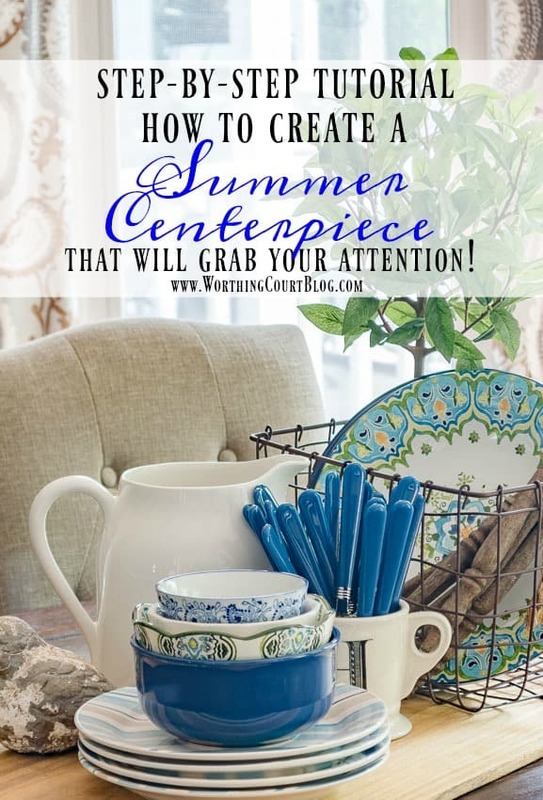 You may not have the exact things in your stash to pull from that I do, but I bet you have enough lying around that you could easily mimic this summer centerpiece! Just look for large for a base (like the breadboard), something tall (like the topiary), an assortment of plates and bowls, a wire basket, something long (like my mini spindles), a pitcher, a mug, some silverware and a cut small’ish decorative element (like my chippy bird). 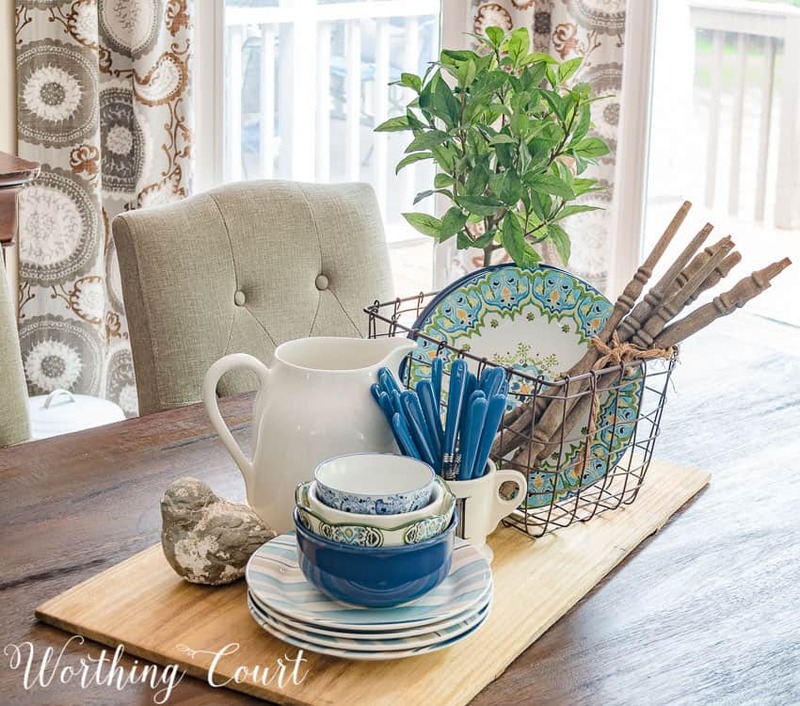 No worries if you don’t own a breadboard – a tray or even a piece of fabric or a table runner will work just fine. No little spindles? Tie a bundle of wood skewers with a piece of twine to use instead. You can purchase them by the bag very inexpensively. A tall vase filled with greenery would work in place of a topiary. This is what the back of the centerpiece looks like. It really isn’t visible unless you walk around the other end of my table. It it were easier to see, I probably would have placed the topiary in a pretty container of some kind. Take a look at this photo chart and you’ll see how easy it was to put together. You can see that I start out with the larger pieces and then fill in as I go. Now my table ties in with the open shelves, all decked out for summer! There’s a lot going on on those shelves, so I didn’t need a large centerpiece on the table. This one is small enough that it compliments the shelves instead of competing with them. I’m loving my view from my spot on the sofa! Are you loving blue and green for the summer as much as I am? Or do you have other colors that say summer to you? Sooo pretty! I will definitely give it a try on my dining room table. Thanks! Blessings. Thanks – you help make everything so easy!! You always give me inspiration. You make it look easy. Thanks for sharing. I love it! I never thought of using dinnerware as a centerpiece. It looks beautiful! Thanks for the idea. You just never know what you have around the house to make a vignette! I love this! It’s hard to think “outside the box” but this is so easy to follow! Can’t wait to see what I can find to make my centerpiece. 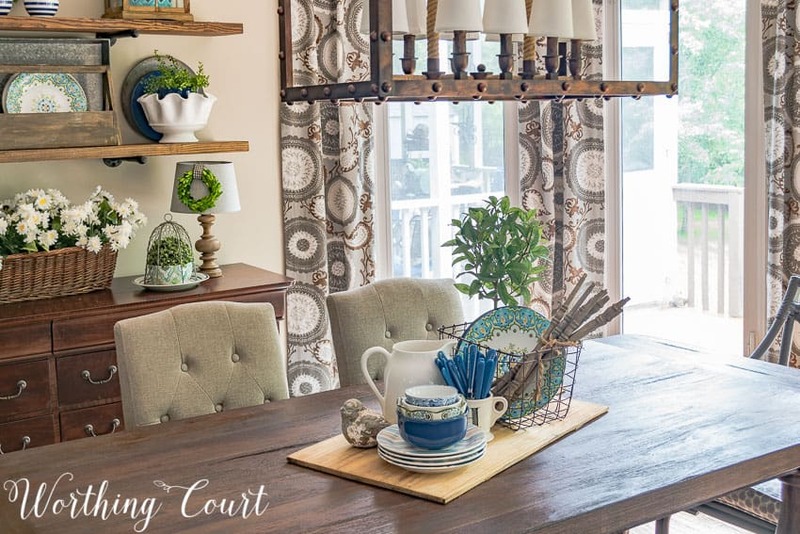 You definitely have a flair for decorating. ? Thanks for the lovely ideas! As for blue and green, those have always been my favorite colors since they’re the color of water. Beautiful! I love the idea of using what I already have. It’s like going on a scavenger hunt! Thanks for breaking down the components of your centerpiece. I like that you put it on the diagonal. I do that too on my kitchen table. Someone usually comes along and “straightens it out” for me, so I have to keep putting I back on the diagonal! Cute centerpiece! I would’ve never thought of using plates, etc., but I love it. Another great how-to for the decorating deficient. Thank you! 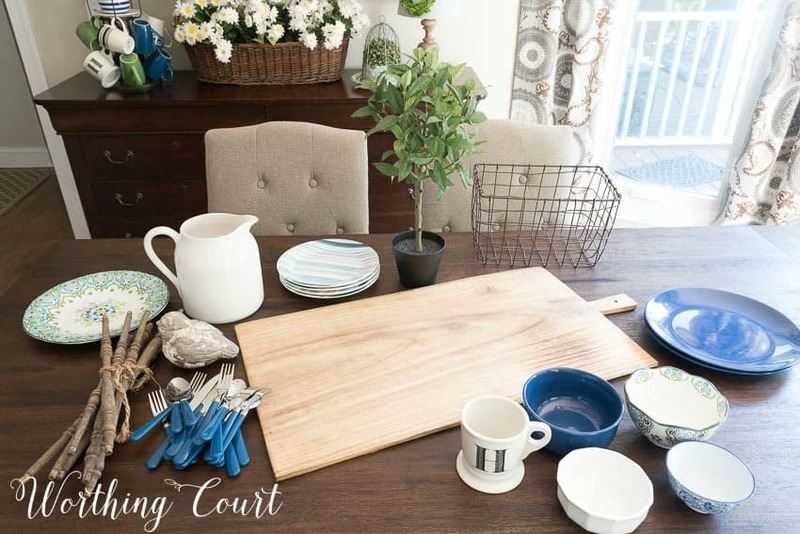 Love this tablescape and your greens and blues are so pretty! Do you usually change up things in the office for the seasons? Thanks for showing us how you put this together! With so much to look at, several wonderful posts I don’t want to miss, will be here for while tonight. Lots of eye candy and educating myself.Even tho am older never think I know it all,love to learn new ideas to gussy up our little home. Your home is a fascinating teacher. I love to see what others like yourself do and take bits of it to apply with my own things. To me when it comes to decorating this is one old dog (77 in couple months) ready to learn new tricks. Terrific! This gets me thinking Suzy. 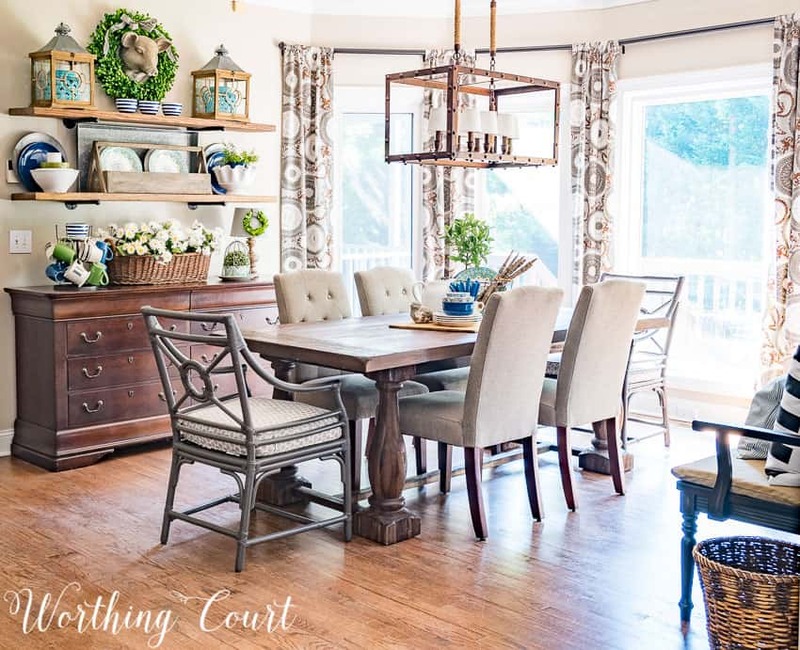 I love blue and green together and this really is so very pretty the way you have it continued in the room–not just the centerpiece. That would have been nice, but this way it makes much more of a statement! in the room. Thanks for sharing! Your table centerpiece looks perfect on your table. Thank you for using items that already in my home for the most part. I bet you do enjoy looking at it from your couch!! Your easy centerpieces are simple for you, not for me! So pretty! I love the idea of using a breadboard! 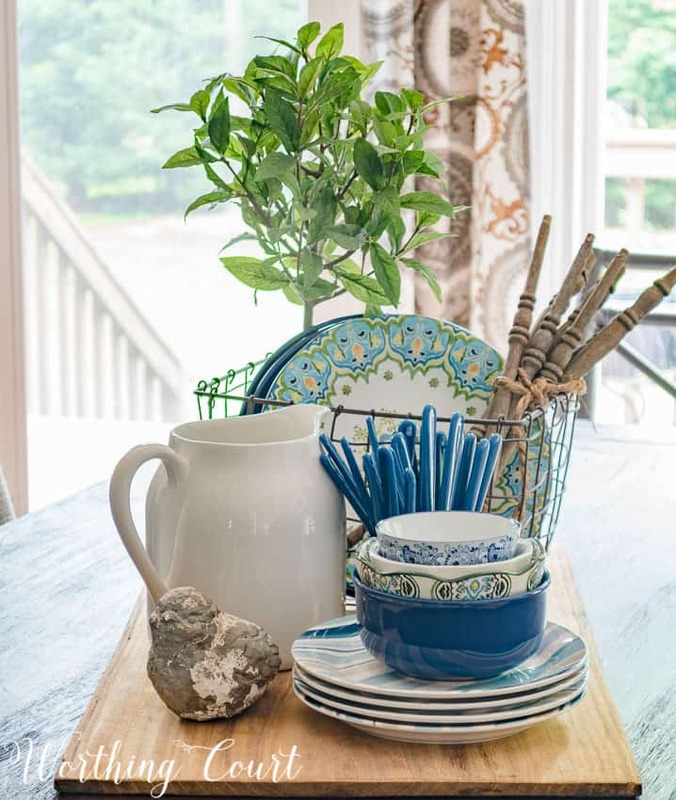 Trays are so charming as well, but it’s a great idea to incorporate something that has more than one use! A great idea. I will finally get to display my dishes that I use on special occasions. Please the ideas coming. As usual, I love everything you do! 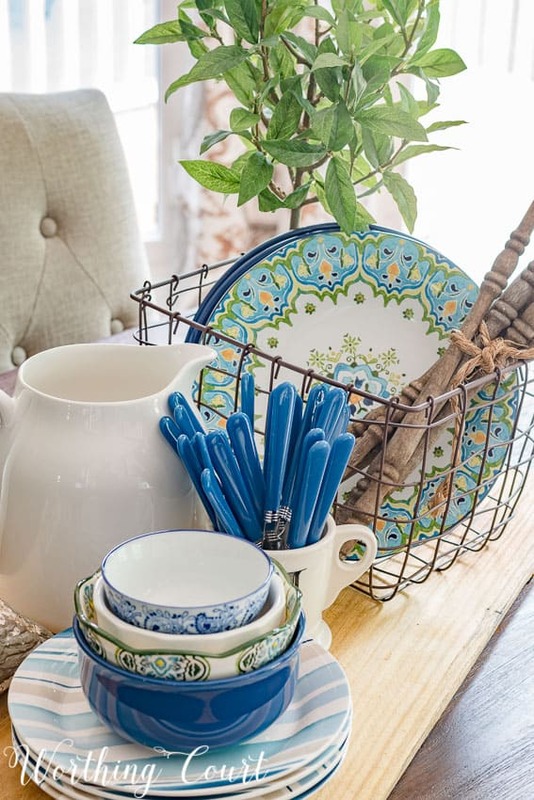 I especially love the mismatched yet coordinating dishes in those fabulous blues. I’ve been inspired today to do something with mine. Right now there sits an empty vase. Boo. Very pretty. And,I’m always a fan of simple projects that save me time! Floral arrangements are still a v bit of a challenge for me. This is very easy and very pretty thank you! Love the colors! I love adding blue items! Gloss, shine and metal…..the three elements I love! Perfect centerpiece Suzy. Love your centerpieces, they say welcome, let’s enjoy a great meal together. Thanks for sharing with Pretty Pintastic Party. 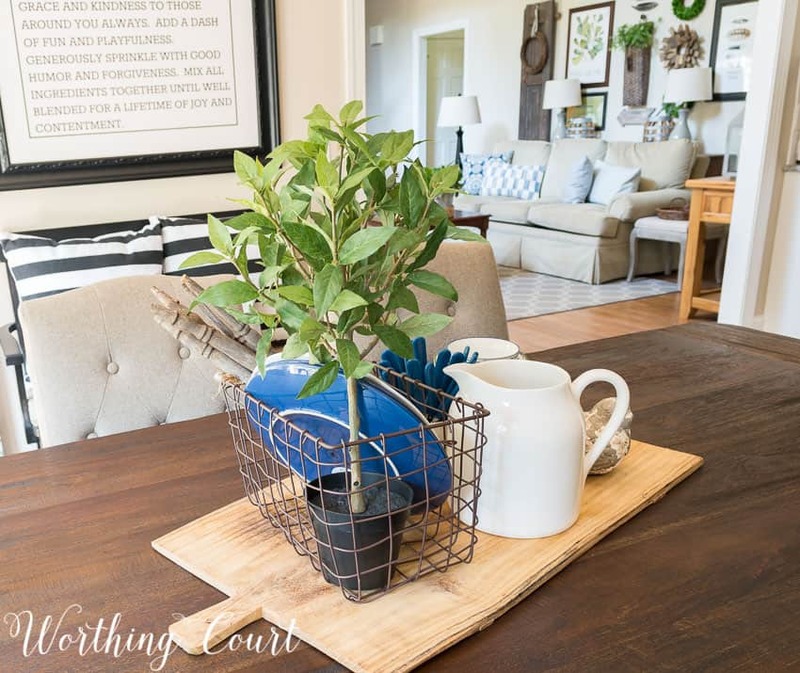 Love the casual centerpiece for the dining room. You always inspire me. Beautiful! !